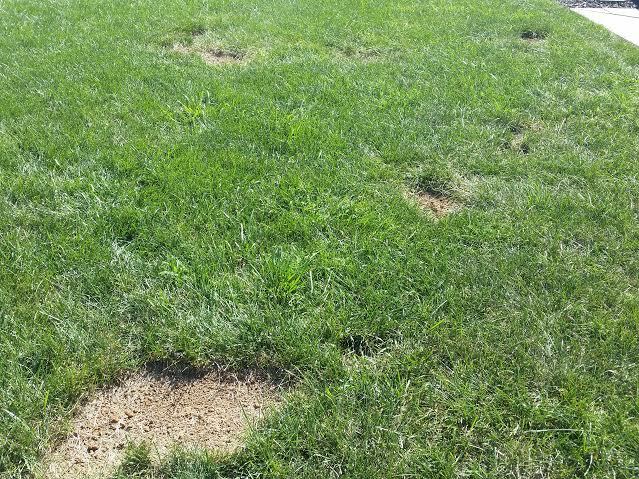 Our lawn has holes in it. 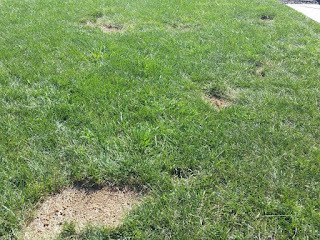 Patches where once beautiful, green grass laid are now barren and brown. Our lawn has been on a journey. For years, we have longed for luscious velvety soft grass. In the past year or so, my heart rejoiced in the fruition of our green dreams becoming a reality. That was until the holes. Crab grass began creeping in our perfect picturesque landscape. Those ugly crab heads spread in spite of conscientious care. It seemed like they just appeared out of nowhere and nothing was working to crush the crabs. My wonderful husband had to take matters into his own hands and dig up the weeds, leaving our grass looking like a green dalmatian with dirt brown spots. I know these holes are only temporary. I know new grass will be planted and will fill the once weed ridden spaces with new life. The holes represent the old being taken out making room for new. Although there may be a time when it looks barren and spotty, there is a fresh newness that will spring up. I am sure you are seeing the analogy in this imagery to our lives in Christ. We have holes. Our holes may be a result of weeds in our lives. Maybe we have already dug up the weeds but there are still barren spots while we wait for fresh new grass to grow. God is filling your holes. He fills your holes and makes you whole. He is planting and tending to those places of barrenness. What are your holes? I would love to hear from you today and pray for you. God is not afraid of your holes and neither am I. Holes don't bother me. New life is coming.